Some of you may know Art Morrison’s work from the latest Playstation 3 game, Gran Tourism 5 Prolouge, which features an Art Morrison 3G Corvette, a 1960 Corvette that won best in show at SEMA in 2007. Art’s latest work is, of course, a 1967 Ford Mustang Fastback which has been totally restored with a vision of reinventing how a musclecar can be built. After spending $3,200 for a solid bodied shell Bobby Alloway dragged the car back to the workshop with visions of creating his own version of Ford Racing’s FR500C Mustang “Boy Racer” Grand-Am Cup car complete with the race-prepped 5.0 Cammer, except wrapped in vintage ’67 steel and with the requisite Alloway touches. 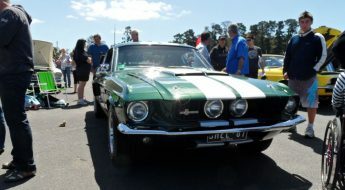 Good connections within Ford had even allowed him access to one of the first 5.0 Cammer race engines available to the public, which sadly ended up being too tall to fit under the planned ’67 Shelby hood. 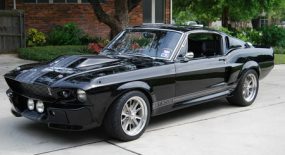 After seeing some of the sketches and ideas being tossed around for the fastback, George Lange, one of Bobby’s biggest fans and the owner of a few past projects, liked the concept so much that he convinced Bobby to build the car for him. This then changed the focus for Bobby meaning the car was now a customers car making finishing the car to perfection a matter of pride. Thankfully enough though George gave Bobby and his team free reign over how they built the car. Engine: Beginning with a standard 4.6L block, Keasler Racing of Maryville, Tennessee, assembled the bottom end of the 281ci screamer using a forged steel crank, Crower rods, Clevite bearings, and 8.5:1 JE pistons with Total Seal rings. On the top end a set of heads from the Ford GT are fitted with Comp Cams valves, FMS cams, and Jesel rockers. That custom-designed intake is fed through two 72mm Accufab throttle bodies and sees 12 psi of boost from two 76mm Turbonetics turbos with Newgen wastegates. Power: In its street-friendly tune, the 4.6 pumps out 839 hp at a shrieking 8,700 rpm on 93-octane fuel. Bobby is confident there’s a few hundred more horsepower left in it with race gas and more boost. Transmission: With an 8,700-rpm redline you gotta have a stick. A T56 six-speed transmission from G-Force Racing was chosen to back the powerful modular and provide long enough legs for the steep 4.88 gears. At 60 mph, the engine is only turning 2,200 rpm. Rearend: The 9-inch center section and axles are from Strange Engineering. A set of 4.88 gears was chosen to counteract the size of the rear tires and let the engine happily wind to nearly 9,000 rpm. Frame: After a good experience on his ’70 Challenger project, Bobby went with another Art Morrison MuscleCar Max-G chassis for this fastback. 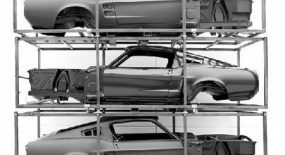 The frame is actually Art Morrison’s prototype of the Max-G chassis available for ’67-’68 Mustangs and features extra braces that connect the frame solidly to the rocker panels for more rigidity. Suspension: The front suspension is based upon Morrison’s control arms and spindles with Strange Engineering coilover shocks with 525 -pound springs. Steering comes from an AGR rack-and-pinion. The rear suspension is Morrison’s triangulated four-link rear with Strange coilovers using 250-pound springs. Brakes: With the prospect of an 839hp car banging gears at 8,700 rpm, Bobby wanted to make sure that George could slow down as fast as he could accelerate, so all four corners are fitted with Wilwood six-piston calipers on 14-inch slotted and cross-drilled rotors. 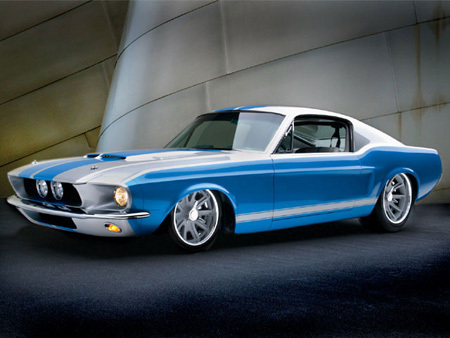 Wheels: Boyd Coddington’s wheel shop built these true knock-off wheels for the Mustang at 17×6 and 20×10 inches. Tires: B.F. Goodrich KDWS tires stick the power to the street with 215/45R17s in the front and 265/50R20s in the rear. 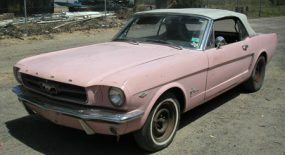 Body: The subtle body mods are numerous, but the most notable are the rear wheelwells (which were stretched 2 inches to accommodate the tires) and the distinctive Mustang body cove, which was recessed by an inch on the quarter-panel. The nose uses reproduction ’67 Shelby parts, but the rear quarter extensions and spoiler were fabricated in-house at Alloway’s Hot Rod Shop. To smooth the appearance further, the fastback C-pillar louvers and ’67-specific side louvers were shaved as were the door handles. Paint: The unique paint scheme was created with Mercedes Brilliant Silver, and the blue is Neptune’s Jewel from DuPont’s Hot Hues lineup. Interior: The custom interior was created by Paul Atkins Interiors in its Cullman, Alabama, shop. The front and rear seats are hand-fabricated and wrapped with leather, the blue leather inserts carefully dyed to match the exterior color. 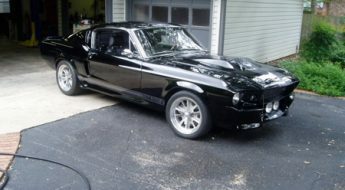 The dash uses a stock Mustang lower, but the top half was made in Alloway’s Hot Rod shop. The custom gauges from Classic Instruments rest in a billet bezel from Goddard Industries. Check out the finished car! 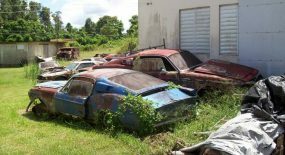 Jim Morrison’s 1967 Ford Mustang GT 500 – Where Is It Now?